Today, traumatic brain injuries (TBI) are among the most common form of injury to the brain. Each year, 52,000 lives are claimed due to traumatic brain injuries, while as many as 1.7 million people are affected worldwide. Most often, traumatic brain injuries refer to physical trauma to the head, though not all incidents produce the same amount or type of damage. Many TBIs are minor, in fact, with only short-term symptoms being displayed by the patient. Others, however, lead to massive brain damage that permanently reduces the individual’s ability to function. Either way, a TBI must be diagnosed and treated immediately. A coup-contrecoup brain injury occurs when the patient endures significant impact directly to the brain. The brain is then slammed into the side of the skull. The resulting damage is both at the impact site and opposite side, due to the brain smashing against the interior of the skull. Such events are typically quite violent, such as serious car accidents, forceful falls, or incidents involving acts of physical violence. A concussion is, hands-down, the most common form of traumatic brain injury. 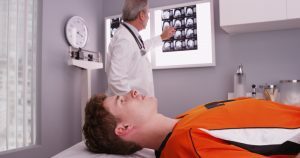 While often considered one of the mildest forms of TBI, concussions do account for hundreds of thousands of trips to the emergency room annually. Most commonly, a concussion is caused by a sudden blow to the head, such as during a car accident, slip and fall, or sports game. A brain contusion often sounds worse than the reality. Typically, a brain contusion is nothing more than a bruise – mild bleeding underneath the skin. Similar to a concussion, a brain contusion can worsen if the bleeding does not stop of its own accord. Then, the situation must be handled surgically. The effects of a mild to severe traumatic brain injury can have quite the long-lasting, and sometimes permanent, effect on your life. Of course, recovery and rehabilitation are both possibilities. However, many people suffering from severe TBI tend to face challenges requiring them to adapt to their new situation altogether – even with treatment. First and foremost, traumatic brain injuries can lead to permanent physical or mental disabilities. Polytrauma is quite common in mild to severe TBI. Furthermore, skills and abilities once held by the individual may no longer feel as possible, or as sharp as they once were. Even after a full recovery, abilities may be hindered. Finally, there are ongoing challenges to consider. Any form of brain injury often leads to slower cognitive abilities. It takes longer to remember things or to count. The change is noticeable. If you or a loved one has suffered from a traumatic brain injury, contact TryMunity. We are the leading support network for individuals and families who have suffered through brain injury. Give us a call at (844) 838-2900.